Have some fun this September at Kudos Casino and iNetBet Casino in NoLuckNeeded.com's private $300 free online slot tournament. Play the exciting Triple Twister slot game from September 1st through September 30th to win your share of the $300 prize pool which is paid out to the top 10 players. Register for the freeroll in the download casino version in the tournament lobby and use the password NLN0918 to unlock the tournament. Free tournament prizes are subject to bonus terms and conditions as listed below and on the casino's website. US Players and most countries are welcome at Kudos Casino. Good luck! 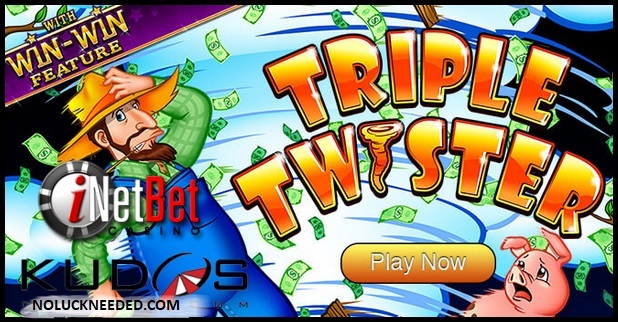 Play the Triple Twister Freeroll at Kudos Casino! shirlsplay requested this tournament, so here it is! Thanks for the great suggestion shirls! The tournament should be available for registration today. This tournament is also running at iNetBet Casino. nutters, How did you do in the tourney? I hope you win some $$$!